The Climate Change debate itself is changing. What if all the Earth's glaciers melted? No. 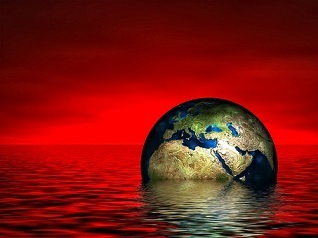 The world is not drowning. This striking image is imaginary. Some still argue whether global warming is actually happening or not. Others accept that it is real, but differ in their belief of whether global warming is caused by human activity or by some shift in nature. Some attribute the temperature rise on Earth to an increase in the heat output of the Sun. With temperature graphs like those shown in Part 13 and Part 14 of this series of reports, it is becoming increasingly difficult to deny that a rapid and unprecedented temperature rise on Earth has been occurring since about 1970. More people now believe that global warming is definitely happening, even though President Trump has asserted multiple times that it is a hoax originating in China. The vast majority of political Conservatives either believe that climate change is not happening or that it is happening and is caused by natural forces beyond our control. Liberals believe that climate change is happening and that it is being caused by human actions. People who had believed that the change is due to natural cause(s) will increasingly accept that it is being caused by human activity. If countries take no action to reduce reduce climate change: a 4.5°Celsius / 8.1°Fahrenheit temperature rise. If countries maintain their current policies: a 3.6°Celsius / 6.5°Fahrenheit temperature rise. If countries comply with their Paris Climate Change Conference pledges: a 2.7°Celsius / 4.9°Fahrenheit temperature rise. Recent global warming is not all caused by human activities. "The record [high temperature during 2016] is due to a combination of the (natural) strong 2015-2016 El Niño (warming of the tropical Pacific Ocean surface) and the strong global warming trend that has continued from 1970 to the present. ... The human-caused, long-term warming trend is the bigger contributor." "[T]he spate of record-warm years that we have seen in the 21st century can only be explained by human-caused climate change. The effect of human activity on our climate is no longer subtle. It's plain as day, as are the impacts -- in the form of record floods, droughts, superstorms and wildfires -- that it is having on us and our planet. "The concept of global warming was created by and for the Chinese in order to make U.S. manufacturing non-competitive." More examples. The only bright news for 2017 is that a new, all-time, record high average temperature will probably not occur this year. That is because El Niño is currently diminishing in strength and will have less effect during 2017 on world temperatures that it did during 2016. What would the Earth look like if all the land ice melted? Enormous amounts of the Earth's water is frozen in the form of glaciers in Greenland, Antarctica, and elsewhere. If they were all to melt, the runoff would run raise sea levels around the world by about 66 meters (216 feet). Fortunately, current estimates are that the sea level will rise by only one meter (3.2 feet) by the end of the present century. However, that will be enough to produce dangerous and damaging flooding in costal areas.